Need help with Spanish? Robert Muth, Ph.D., has developed some of the best Android apps for learning Spanish, including all those tricky forms of the Spanish “to be” verbs: ser and estar. Knowledge es delicioso, no? For example, his Spanish Verbs Trainer app – available in free and $3.99 pro versions – reinvents the idea of drilling with flashcards. 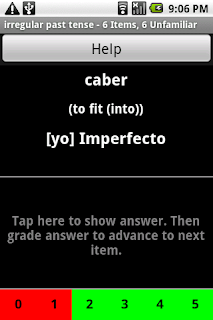 You select a drill, say imperfect tense verbs (imperfecto en espanol). 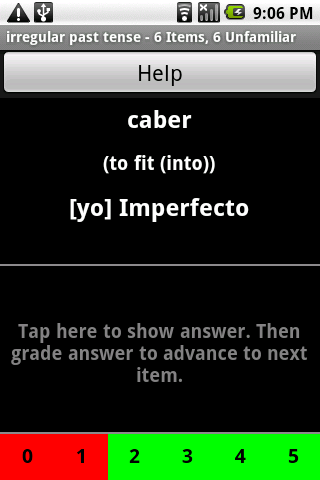 The app will prompt you with a Spanish verb e.g. caber (to fit into). You then think through all the forms of caber, including the one asked for – in the example below, the first-person form: yo. Think you know it? Just tap the lower half of the screen to reveal the correct answer. Now here’s the exciting part. Once the answers are revealed, you self-evaluate. If you rock-solid knew the answer, you rate yourself a 5 on that one. If you had no clue, you give yourself a 0. So-so, anywhere from a 1 to 4. The Android app then uses your self-evaluation to customize future drills. It will rarely ask you about the items you already know, and will keep asking you those toughies that you’ve been avoiding. Since developing his five Spanish apps, Muth has put his intelligent flashcards to work for students who need help with English, French, Italian, Portuguese and German. All are available at his Appicenter store on Google Play. 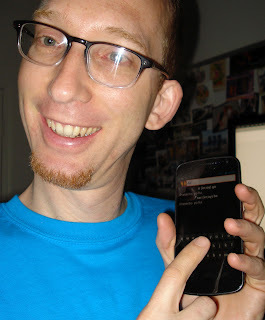 As for me, well, I found the apps easy to use, but also a humbling test of my true abilities. Vosotros? Ay, yay, yay. I’ve got some estudiando-ing to do.